The record-setting cold and snow in South Dakota this winter led to record demand for power. The cold snap also highlighted the need for the continued use of coal and natural gas generation as many wind generators in the region had to be shut down as a result of the frigid weather. Extreme cold descended into the Upper Midwest in January and didn’t release its grip for several weeks. East River Electric Power Cooperative, which supplies wholesale power to 24 rural electric cooperatives and one municipally-owned system in eastern South Dakota and western Minnesota, experienced an all-time record peak for electric demand on January 29 and 30. Wind chills dipped to 20 to 50 degrees Fahrenheit below zero during that time period. “The East River system performed well under these extreme weather conditions with very few issues,” said East River General Manager/CEO Tom Boyko. Member co-ops of East River Electric depend on a reliable supply of power from Basin Electric Power Cooperative in Bismarck, North Dakota, as well as hydropower from the Western Area Power Administration. Basin Electric owns and operates the coal, gas, diesel and wind generation resources needed to meet the demand of member co-ops located in nine states in the middle of the United States. Basin Electric had plans in place to meet the demand of co-op members during the extreme cold in January and February despite the challenges the frigid temperatures caused its generation resources. Basin saw many of its wind towers in North Dakota and South Dakota shut down as a result of cold temperatures and had to rely on natural gas and coal generation as well as market purchases. According to Basin Electric Senior Vice President of Operations John Jacobs, wind towers become brittle and cannot operate during extreme cold. Weather stations installed on each turbine automatically shut down the wind tower when temperatures drop to 22 degrees F below zero. Those temperatures put the components of the wind tower at risk of failure. That is the reason production from Basin Electric’s wind resources bottomed out in the early morning hours of January 30 when the Bismarck area saw air temperatures of 31 degrees F below zero in North Dakota and the National Weather Service in Aberdeen, South Dakota, reported record low temperatures of 33 degrees F below zero or lower in Aberdeen, Watertown, and Groton. Basin Electric’s fleet of natural gas and coal-fired power plants paired with energy purchases from the market provided co-op members with a reliable supply of electricity during that period. “That’s why we have gas peaking units and you have that coal resource base that just continued operating despite cold weather over the entire area,” Raatz said. Basin Electric uses an ‘all of the above’ approach to supply electricity to member co-ops throughout South Dakota. Nearly 45 percent of its generation portfolio comes from coal-fired resources while 20 percent comes from natural gas units and another 20 percent from wind generation. Basin Electric is also a member of four power pools which are large regions of the United States where utilities can buy and sell electricity in the market, and Basin Electric has the contractual transmission rights to more power between these regions. “It is a combination of all those owned-assets and market purchases that come to bear to serve member load obligations,” Raatz said. Basin Electric generates electricity for 141 electric co-ops in nine states and has power plants and resources in North Dakota, South Dakota, Montana, Wyoming, and Iowa. Raatz said that regional diversity is just as important to providing reliable power as a diversified generation mix. “That’s so valuable in coming up with a power supply. You don’t necessarily see that cold weather over the whole area,” said Raatz. That regional diversity was evident during the cold snap in North Dakota and eastern South Dakota at the end of January. Rushmore Electric Power Cooperative which supplies power to eight electric cooperatives in western South Dakota saw higher demand for electricity during those time periods but never saw a record peak like the East River co-ops experienced. During that period Basin was also able to pull generation from resources in Montana and Wyoming because it wasn’t as frigid in those states. Raatz said load management programs which control water heaters, grain bin fans, and other large loads during peak demand periods are also a piece of the power-supply puzzle. 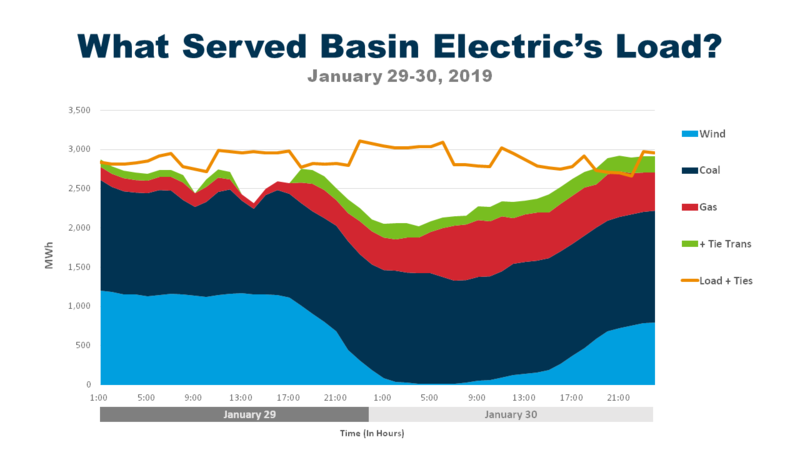 Raatz said the team at Basin Electric which forecasts electric demand can rely on members who have load management devices installed at their service locations to make those peaks less extreme. “As you get into these types of conditions when it gets really cold, it is easier to predict because load management is taking out the spikes. It is really valuable,” Raatz said. The main goal of electric cooperatives is to provide safe and reliable power for members at the end of the line. Jacobs said it takes a dedicated team of co-op employees to achieve that mission whether it is the operators at Basin Electric’s power plants or the co-op linemen at the local level. And when the Great Plains and Upper Midwest experiences extreme weather the goal of maintaining reliability becomes even more important.